In this guide, you'll learn how animated collages work, where to find the templates, and how to make your own. For those of you who are the visual type, we've made a video lesson - click Play below and enjoy 3D collages in all their glory! There are a few examples and the steps to making a simple collage by yourself. How to put a photo collage on your slide? One way is to use ready-made templates. SmartSHOW 3D has a collection of collage presets to choose from. Click the Collages tab and have a solid look at them, there are lots of stylish templates, including 3D. You can preview each of them simply clicking on the effect and then on the big play button on the right. 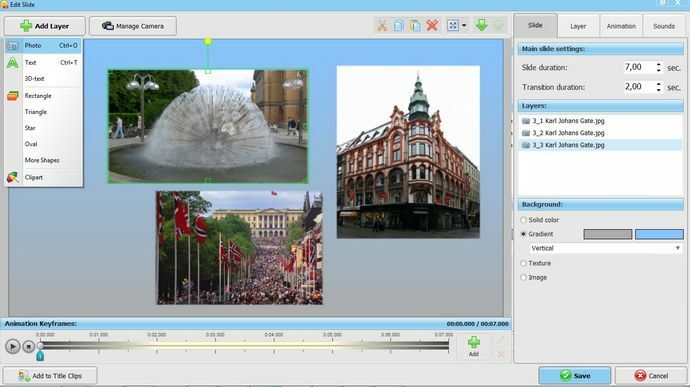 Drag an effect you like to the timeline and then add the photos to the corresponding slots.You can customize the collage later using the Slide Editor. 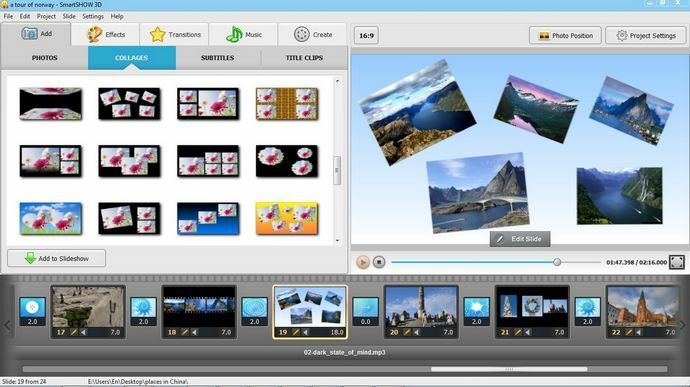 You can also make a collage from scratch.To create a new animated collage, insert a blank slide first. In order to do that, right-click on the timeline and choose Insert Blank Slide, or simply press Ctrl + Ins. Then double-click on the new slide to open the Slide Editor. Choose a background - solid color, gradient, texture or an image from your computer. Now add a few photos. To add a photo, click the Add Layer button in the top left corner and select Photo. You can add up to 10 photos to the slide. We recommend keeping the reasonable amount of photos not to go over the top; otherwise the overall look of the slideshow can easily be spoiled. Animation is a great way to make unique projects, and it’s not only about collages, you can even create awesome 3D slideshows! Now let’s add animation effects to the photos we’ve added. Select a layer and click on the Animation tab. Add animation with the help of keyframes. Set the position of the object for the first keyframe, then add the second keyframe, and adjust the settings. Animation settings include panoramic motion, scale, rotation (simple or 3D rotation), transparency - edit one or several settings, depending on how you want the object to behave. To preview the result, click on the Play button. In the same way, you can set animation for the rest of the objects on the slide to make them move, disappear or rotate in space. So if you want to try making a slideshow with animated collages, download SmartSHOW 3D here and use your imagination and creativity to design an awesome slideshow project! Have a question or a comment? Post it here! Want to make stunning photo movies with your own pictures? That's as simple as ABC with SmartSHOW 3D software! I shoot weddings for a living, and often make wedding and love story slideshows for my clients. 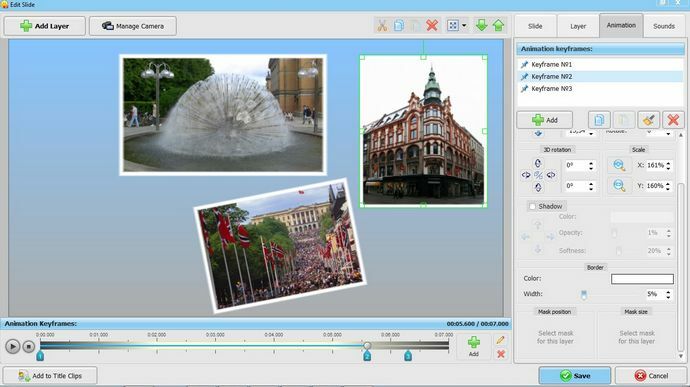 I used to do that with Windows Movie Maker, but then I came across SmartSHOW 3D and realized the immense potential of photo slideshow. This software now helps me do incredible things with my photos. Lots of thanks from happy clients! I love making movies from our family and travel photos. Have tried a number of slideshow makers, but this one is something special. All kinds of fascinating effects and animation, music and voiceover, and excellent quality video in the end! Never thought I'd learn to make SUCH movies myself one day. Need to create a professional photo slideshow? Start now with SmartSHOW 3D!